On Saturday, 26 May, Hocken hosted a public performance event to celebrate both Music Month, and some treasures of our sheet music collection. These are only a few of the gems in the collection, and items that deserve an airing to a contemporary audience. Some – Pokarekare, Blue Smoke, and Now is the Hour – are well known, but others, such as Bowling have been lost to time. 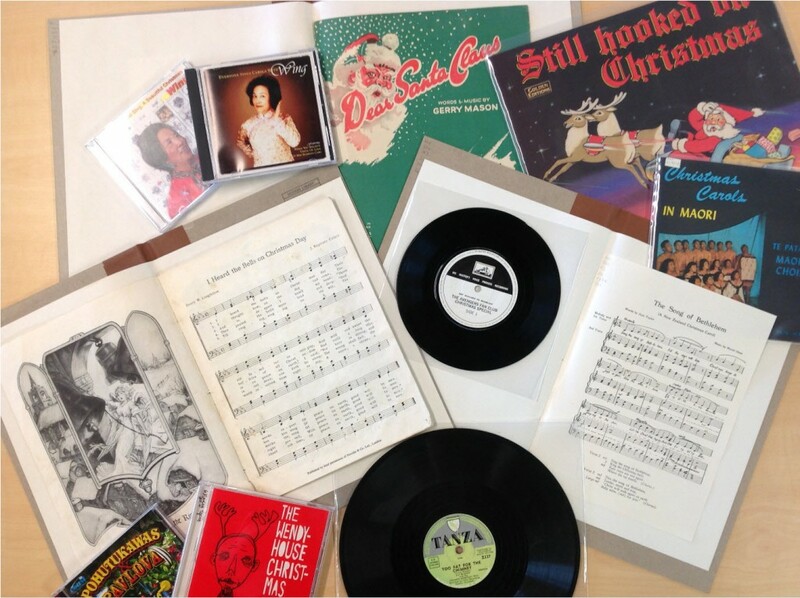 The published sheet music collection at Hocken is extensive at over 2,500 sheets that represent all styles and genres in New Zealand’s music history, from piano-and-vocal songs to atonal and avant-garde contemporary pieces, and all forms of popular music in-between. This collection has many treasures including some of our earliest music sheets: Te Heu Heu and Mrs St George’s Whalers of the Deep Deep Sea, which dates to c.1857; the first English edition of God Defend New Zealand from 1876; All Hail! Zealandia by Frederick Leech and Francis Valpy of 1874, and James Brown’s 1894 Tarakoi Waltz are only some of the gems tucked away. Contemporary treasures are collected too, and although these may not have a rarity factor at present, future researchers may rediscover them as unique items that deserve reappraisal. Treasures in the collection are varied, but here are some highlighted in the Music Month performance. George Laidlaw emigrated to New Zealand in 1901. He and his family settled in Dunedin, and within a year he was appointed conductor of the the Kaikorai Brass Band. During the First World War, Laidlaw was known for composing several popular songs, including British Boys (1915), with words by R.L. Christie, and When the Boys Come Home, with lyrics by G.A. Wycherley (1916). 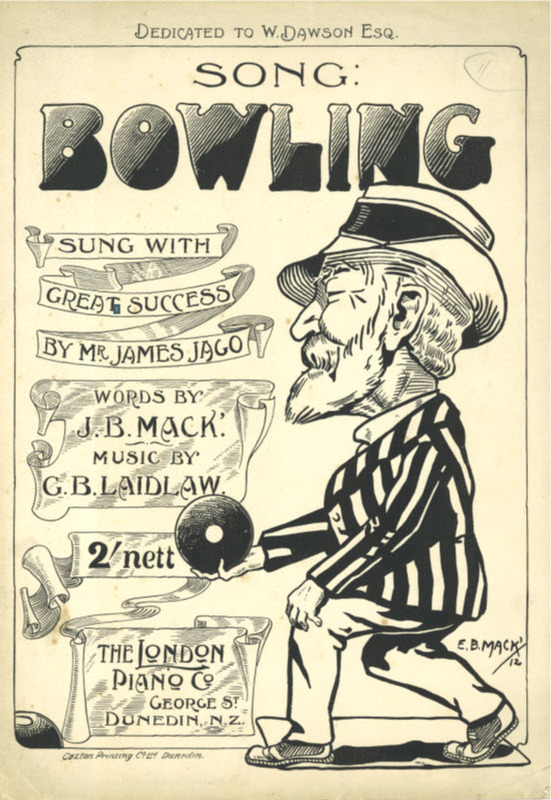 Bowling, written with lyrics by J.B. Mack, is less well-known. Written around 1912, the Evening Star of 3 August that year advertised it as played by the Kaikorai Brass Band at His Majesty’s Theatre on 7 August. The Evening Post on 7 April 1915, reporting on the death of lyricist J.B. Mack, described the song as having ‘achieved more than an average amount of popularity.’ The audience at our Music Month event participated in what might have been the song’s first public performance in over a century. Bowling. Words by J.B. Mack; Music by G.B. Laidlaw. The London Piano Company, c. 1912. Hocken Sheet Music Collection. 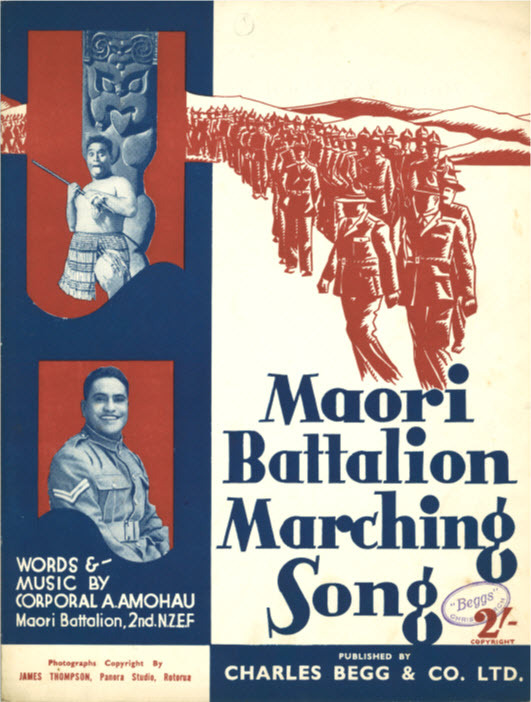 Maori Battalion Marching Song. A. Amohou. Charles Begg and Company, 1940. Hocken Sheet Music Collection. 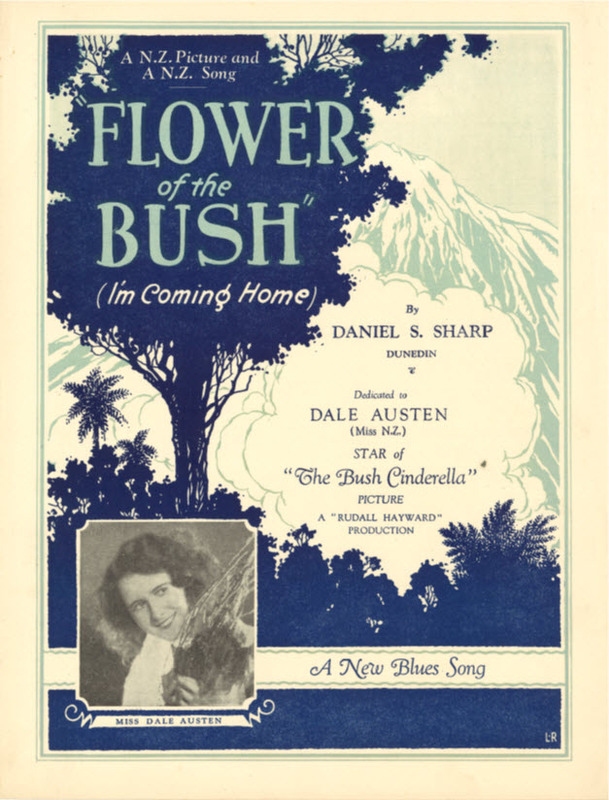 Flower of the Bush was dedicated to Dale Austen, star of the 1928 film The Bush Cinderella, and the second Miss New Zealand. Advertised on the cover of the music sheet as a ‘N.Z. picture and a N.Z. song’, Flower of the Bush was inspired by the film, and performed at the Strand Theatre in Dunedin by the Strand Orchestra ,with arrangement by L.D. Austin. Dunedin composer David S. Sharp (or Daniel. S. Sharp as he is called here) was a prolific songwriter, with titles including Tawhaki, The Prisoner’s Return, The Fairy Tale Parade, Caring for the Rose, and Surging Seas (among others). Flower of the Bush. Daniel. S. Sharp. [publisher unknown] c. 1928. Hocken Sheet Music Collection. Pōkarekare Ana (originally known as Pōkarekare) and Pō Atarau were both written before the First World War, and both have almost moved into the realm of folk song, due to ‘the ease of which they have travelled, their oral transmission, and the conflicting sources for their composition” (Bourke, 2017, p.187). Pōkarekare Ana (written c.1912) was attributed to Paraire Tomoana after his death, although he never claimed to have written the song. However, Tomoana and Sir Apirana Ngata did publish the lyrics in 1921, saying the song had originated in North of Auckland, becoming popular in the Devonport Narrow Neck Military Camp, before travelling to the East Cape (Bourke, 2017, p.187). 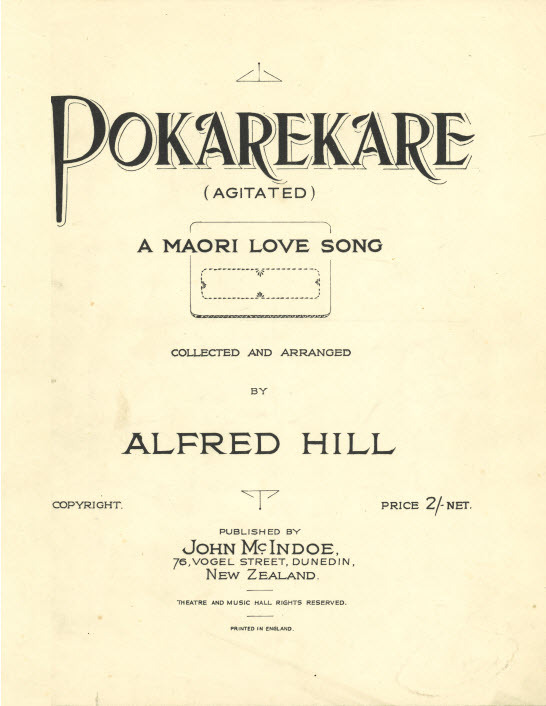 Pōkarekare was often referred to as a ‘Maori Love Song’, and a favourite of entertainer Bathie Stuart, who performed it locally in 1918, with The Colonist (11 June 1919) reporting that she sung it ‘with characteristic expression.’ The song became popular again in the 1920s, with arrangements by Alfred Hill (illustrated below) and Hemi Piripata (James Philpott) in 1927, and again the following year, when Ana Hato recorded the song as part of her performance for the Duke and Duchess of York’s visit to the Tūnohopu Meeting House in Ohinemutu, Rotorua. Ernest McKinlay also recorded the song in Sydney in 1927. Pokarekare: A Maori Love Song (arr. Alfred Hill). John McIndoe, c.1926. Hocken Sheet Music Collection. Pō Atarau (Now Is the Hour) has a similarly unclear history. Thought to have been written sometime around 1913, the melody was adjusted from an Australian instrumental called Swiss Cradle Song by Clement Scott, with lyrics (in Māori) added around 1915 and centred on a farewell theme (Bourke, 2017, p.188). In 1919, songwriter Maewa Kaihau also used Scott’s melody for her song Haere Ra (Goodbye) Waltz Song, which had a verse that began with the lyric ‘this is the hour’, and by 1935 the song was a well-known last waltz at farewells. It was frequently heard when soldiers were departing for the Second World War, and was a popular chorus during concerts in the 1930s and 1940s. The Evening Post for 11 May 1938 has Pō Atarau listed as part of the finale of the Ngati Poneke Maori Concert at the Wellington Town Hall. The song became internationally famous in 1947, when Gracie Fields recorded it under the title Now is the Hour, and again the following year when Bing Crosby recorded it, sending the song to the top of the American music charts. Below is the inner label from the Rotorua Maori Choir’s version of the song, recorded in 1930. Po Atarau. Rotorua Maori Choir. Columbia Records, 1930. Hocken Sound Recordings Collection. These, and other treasures of the Hocken sheet music collection, are available to view on request, as are any recordings of these songs in Hocken’s recorded music collections. Please enquire at the reference desk, or contact the Curator, Music and AV for any further information on these collections. Bourke, C. Goodbye Maoriland: The songs and sounds of New Zealand’s Great War. Auckland: Auckland University Press, 2017. [Unknown author]. (11 June 1919). “Empire Theatre.” The Colonist. Retrieved from https://paperspast.natlib.govt.nz. [Unknown author]. (11 May 1938). “Current Entertainments.” The Evening Post. Retrieved from https://paperspast.natlib.govt.nz. [Unknown author]. (6 November 1940). The Press. Retrieved from https://paperspast.natlib.govt.nz. [Unknown author]. (3 August 1912). The Evening Star. Retrieved from https://paperspast.natlib.govt.nz. August was inaugural Māori music month, a celebration of Māori music around the country of all genres. The first music recorded in New Zealand was indeed Māori, when Ana Hato and Deane Waretini were recorded singing a number of songs, including Hine e Hine, and Waiata Poi. This was in February 1927 at Tūnohopu meeting house, in Ohinemutu, Rotorua, and their accompanists included the nascent Rotorua Māori Choir. While their story is the stuff of musical history, less has been written about the Rotorua Māori Choir, and their seminal recordings of 1930. The Rotorua Māori Choir had been in existence for at least two decades, having been formed in the early 1900s by Frederick Bennett, an Anglican Clergyman. Before making their famous recordings, the choir had been part of New Zealand’s first feature film, George Tarr’s Hinemoa, from 1914. In 1929, the choir’s lawyer (a Mr. Simpson) suggested to Arthur Eady (of Arthur A. Eady Publishing) that the choir be recorded. This suggestion was taken to Columbia Gramophone Company, who agreed, and a contract was signed by three choir members – Geoffrey Rogers, Tame Petane, and Rotohiko Haupapa. In 1930, a group from the label (including musical director Gil Dech, managing director W.A. Donner, and engineer Reg Southey) came to New Zealand to record the choir, and this took three months – a significant commitment of finances and resources. Dech, who had been to New Zealand before, became closely acquainted with the music by listening to the songs sung to him repeatedly by the choir before the recording started, though his introduction to the some of the music originally occurred when he accompanied and conducted the recording sessions of Scottish tenor Ernest McKinlay, who recorded Māori songs in Sydney in 1928. By all accounts, the recording sessions with the Rotorua Māori Choir were long and often hard, as choir members had day jobs, and the recording sessions often lasted until the early hours of the morning. Dech was keen to have the choir harmonise naturally, but often wrote harmony parts and taught them to the group – Reg Southey confirming “he trained them to sing as a group – most of them were used to singing solo.” There were soloists, however: bass baritone Rotohiko Haupapa, soprano Te Mauri Meihana, contralto Mere Amohau, and tenor Tiawhi Ratete. As with Ana Hato and Deane Waretini before them, the Rotorua Māori Choir recorded at the Tūnohopu meeting house at Ohinemutu, Rotorua. To create a better environment to record in, shawls and carpets were hung from the roof to dampen the echo, and a production/control room was assembled in the porch. Southey recalled that the recording sessions were to record Māori singing and song, which they “felt was unique and should be put on record for all time. So many visitors… came to New Zealand, heard these singers and asked where they could buy recordings. They weren’t available… we wanted to correct that.” The recordings were cut directly to fragile wax discs (two recordings were cut, and the best one chosen for use), and sent to Australia, where copper master records were cut. Over thirty songs were recorded (in what Mervyn Mclean called “the European melodic idiom”): folk songs, love songs, and farewell and welcome songs, as well as two English hymns in Te Reo: Au e Iho, and Karaunatia. 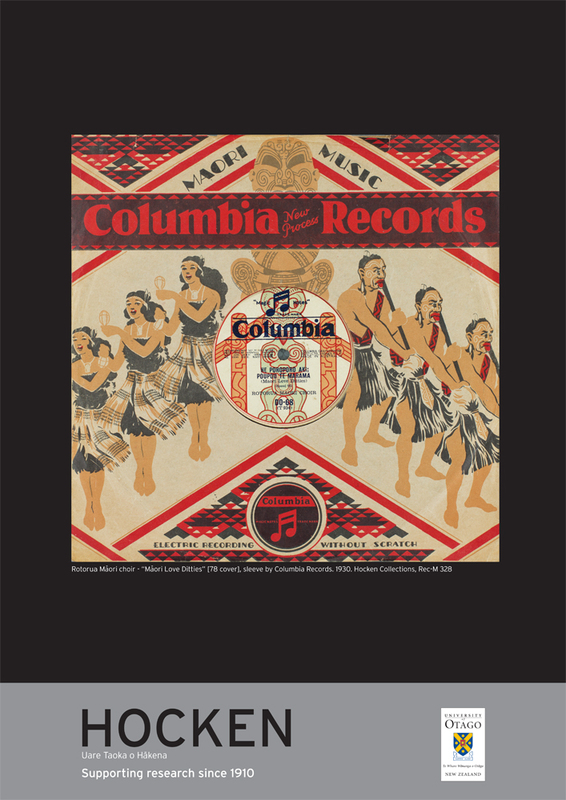 Originally issued on 10” shellac 78rpm discs, in 1961, all but three of the songs were taped from the master discs and pressed to LP, bringing the Rotorua Māori Choir to further recognition. 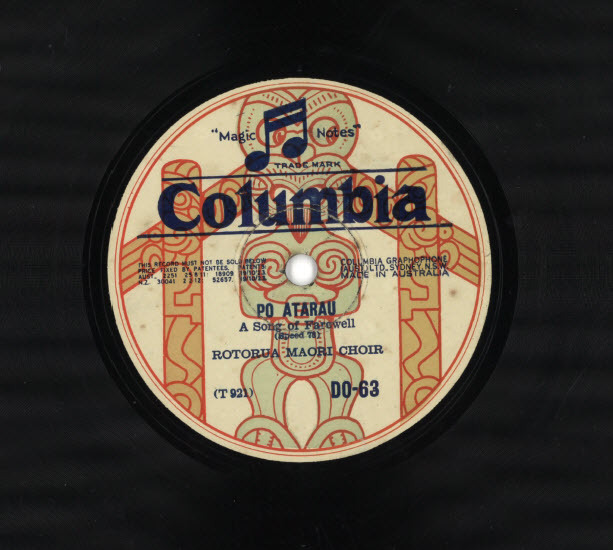 To illustrate the talents of the Rotorua Māori Choir, we have digitised some of our original 78rpm discs. One of the best examples of their vocal abilities is Warutia Putiputi Pai, a Māori love ditty, where the range of the choir members, and the style of the musical director is evident. The disc is in remarkably good condition for being 86 years old, though there are ‘pops’ due to the nature and slight deterioration of the format. Armstrong, A. (1961). Records: Still popular after thirty years. Te Ao Hou, 36 (September), p. 63-64. Mclean, M. (1996). Maori Music. Auckland: University of Auckland Press. [Unknown author]. (1964). Pioneer returns. New Zealand Listener, 20 March. p.10. However, many recordings have remained in the public consciousness, with arguably the most well-known being Kingi Ihaka’s “Pukeko in a ponga tree”. 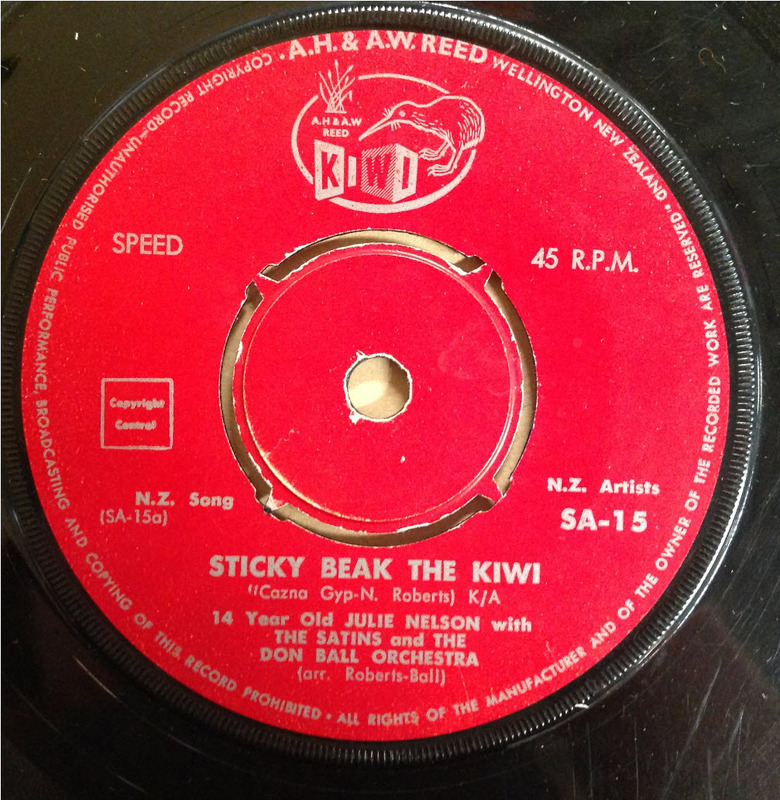 Along with Billy T. James’ “When a child is born”, Julie Nelson and The Don Ball Orchestra’s “Sticky Beak the kiwi” is still incredibly popular. “Sticky Beak the kiwi” was written specifically by Gisbourne-based folk singer Bob Edwards and lyricist Neil Roberts for children in 1961. 14-year old Julie Nelson sang the song, backed by the Whanganui dance band, the Don Ball Orchestra. The song became a hit. Well known bands like the Avengers in the 1960s, and Split Enz in the 1980s, recorded Christmas messages for their fan clubs, in a similar vein to the Christmas fan club recordings released by The Beatles. Billy T. James released “A Maori Christmas” for Radio Hauraki, while Fred Dagg released the infamous short track “Star of wonder”. These tracks were among the local songs gathered together in the 2012 Christmas-themed CD Pohutakawas & pavlova. Along with Wing’s two albums of Christmas music (Everyone sing carols with Wing, and Carols, rap and sing: A beautiful Christmas), another Christmas-themed holding we have is Wendyhouse’s The Wendyhouse Christmas album, which has alternative (and often subversive) Christmas tracks such as “Teddy’s anger”, and “Here comes the family”. Our sheet music holdings have some interesting items too – “The song of Bethlehem (A New Zealand Christmas carol)” from 1942 by Muriel Hunt and Joye Taylor is a short piece that centres on the seasonal features of the New Zealand Christmas. “Dear Santa Claus” in contrast (written in the UK in 1948 by Gerry Mason, and published locally by Beggs), is more traditional in theme, focussing on a child’s letter asking Santa Claus to not forget him. 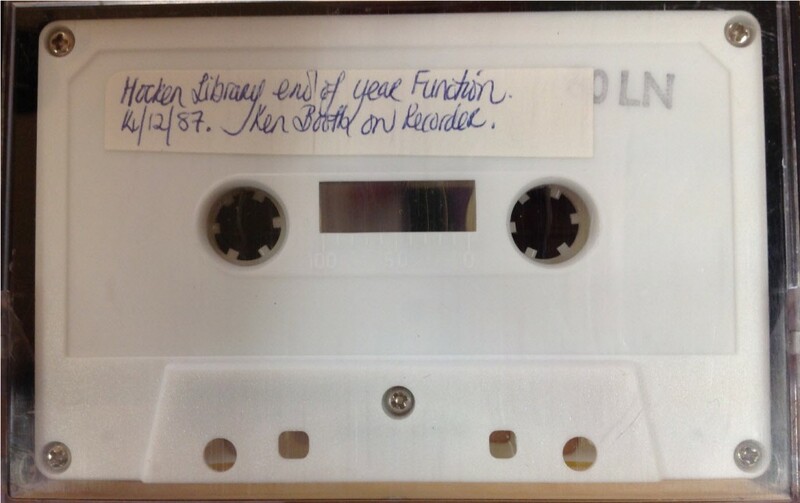 Finally, one very interesting holding we have is particularly close to the Hocken Collections: the Hocken end of year function from 1987, featuring the recorder skills of Ken Booth. This cassette is definitely one for the digitisation list! Johnny Cooper (the ‘Maori Cowboy’) was a local rock’n’roll hero. Cooper grew up on a Te Reinga farm in the 1930s, becoming a fan of Gene Autry during his childhood. While living with his aunt and uncle, he listened to their 78rpm disc collection, his favourites being Autry, Tex Morton, and Wilf Carter. Cooper learnt to play the ukulele along with the records, soon performing to shearing gangs. After gaining a scholarship and attending Te Aute College for two years, he went to Wellington and found work as a gravedigger. Not long after, he formed a country and western band with Will Lloyd-Jones on slap bass, Ron James on piano accordion, Don Aldridge on steel guitar, and later, Jim Gatfield on guitar. They called themselves Johnny Cooper and the Range Riders. The band entered talent competitions, coming first in the talent quest at Wellington’s Paramount Theatre, winning £20, and an audition with HMV. In 1954 Cooper went to Korea to entertain the New Zealand troops, and on returning, HMV asked the band to record with the label. This resulted in their first hit, a duet with Margaret Francis of a cover of One by One, backed with Cooper’s own song Look What You’ve Done – a song that found another life 40 years later when it featured in ‘Once Were Warriors’. HMV then approached Cooper about recording a new genre: rock’n’roll. HMV were keen for Cooper to cover Bill Haley and the Comet’s smash Rock Around the Clock, though Cooper was sceptical, and didn’t really like the genre. However, he recorded it (and the b-side Blackberry Boogie), and it became a hit. Interestingly, Cooper’s version was released locally before Bill Haley’s version. 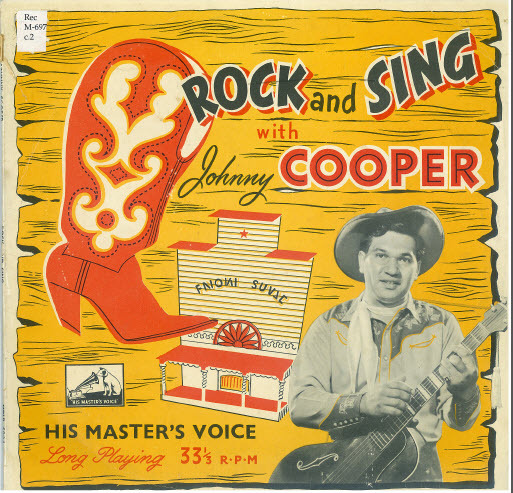 In 1956, HMV released its first New Zealand rock album, ‘Rock and Sing with Johnny Cooper’, a 10” compilation that placed his country recordings with Rock Around the Clock, and Blackberry Boogie. Cooper also released a second rock’n’roll cover by Haley – See You Later Alligator in 1956 (this time on 45prm as well as 78rpm disc). Cooper’s third single made him a significant name in local music history. Pie Cart Rock’n’Roll (1957) was (as the story goes) about the Whanganui pie cart, where Cooper and the band would get their ‘pea, pie, and pud’ meals. Pie Cart Rock’n’roll was considered the first locally written rock’n’roll song. However, this is thought to be incorrect – Sandy Tansley’s 1957 song Resuscitation Rock (according to researcher John Baker) was released a few weeks before Pie Cart Rock’n’roll in September 1957.
Cooper and the band kept their audiences broad by appearing in variety shows. In the late 1950s he began the ‘Give it a Go’ talent quest, with musicians such as Mike Nock, John Rowles, and Midge Marsden appearing. The talent shows ended in 1968, and Cooper released his last single, Break the World in Two / Cold Cold Heart on Impact. He continued to perform in the 1970s as The Johnny Cooper Sound, and in the 1980s as part of the Original Ruamahanga River Band. He retired in the 1990s. Johnny Cooper was 85 when he passed away last week at his home in Naenae. Music Month has rolled around once again! This year, to draw attention to the recordings and music-themed material we have in the collections, we have created six posters that illustrate our interesting (and often decorative) holdings. The posters are currently displayed in the University of Otago’s stone archway on campus. 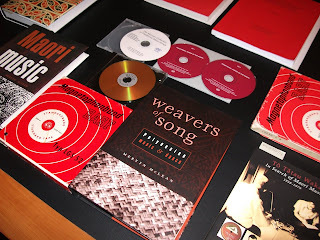 They represent the various aspects of the music collections, including The Dunedin Sound, locally-focussed music sheets, and early 20th Century Māori music released on major international labels (and the attractive sleeve that accompanies it). We have also included an image of some of our more interesting and rare formats: cylinder, mini-CD, and (intriguingly) a disc the size of a business card. Also featured are examples of our music posters and music ephemera: programmes dating back to the 1920s. Some of the images are well-known: the cover of ‘Doledrums’ by The Chills is hand drawn by the bands founder, vocalist and songwriter, Martin Phillipps; while the cover of ‘Bird Dog’ by the Verlaines is by John Collie, local musician and artist. 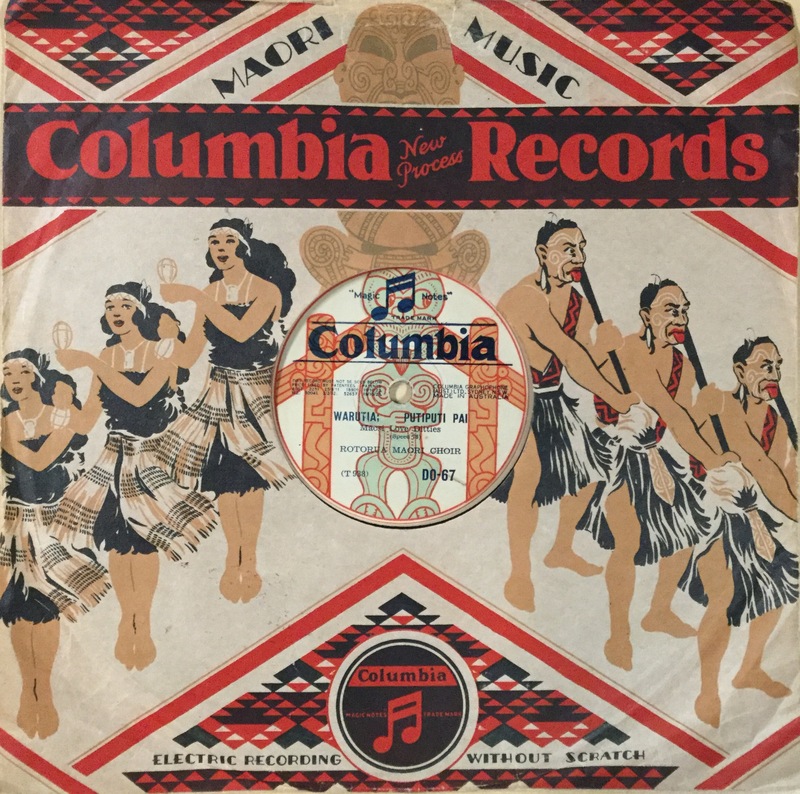 The sleeve for Columbia Records’ Māori Recordings would have been familiar in the 1930s, but is now mostly forgotten to all except collectors and music historians. Graphically designed in red and black, the sleeve speaks to the Māori Marae design on the disc’s label. 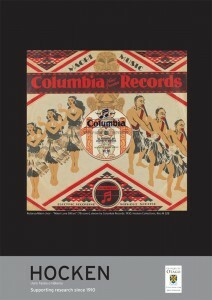 This label was used for local Māori recordings on Columbia Records. 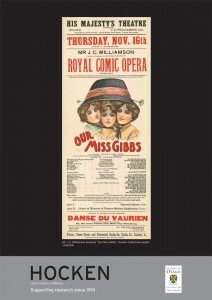 The eye catching poster for the Royal Comic Opera ‘Our Miss Gibbs’ dates to 1911 and this production was described in the Otago Daily Times at the time as “…the Greatest Musical Comedy Success Of Our Generation.” The ephemera collection includes a large number of programmes for a variety of musical events in Dunedin from the late nineteenth century through to the present day. Some colourful examples of these are represented on one poster and they demonstrate a few of the musical genres included in the collection. One of our most significant donations in 2009 was the Dr Mervyn McLean collection of Maori and Cook Islands music. The collection has been added to the archives and manuscripts section of the Library and is catalogued under the call number ARC-0613. It is fully listed on the Hakena catalogue. Right: Dr Mclean, Anne McLean and Professor John Drummond at the Hocken Collections 2009 Donors event. Dr McLean is acknowledged world wide as an authority on the music of Oceania, particularly traditional Maori music. A graduate of the University of Otago, Dr McLean was the founding Head of the Archive of Maori and Pacific Music at the University of Auckland from 1970 until his retirement in 1992. The collection that has been donated to the Hocken is Dr McLean’s personal collection of the original tapes, notes, transcriptions and translations of the waiata, cds and mint copies of his books. The material relates mainly to NZ Maori with recordings dating back to 1958, but also includes 30 hours of material recorded in Aitutaki and Mangaia in 1967. Although it duplicates what is already available through the Auckland archive, this generous donation will allow more researchers to access the material here at the in Dunedin. The collection will be useful to iwi, musicians, historians, anthropologists, ethnomusicologists and other researchers who will be able to listen to the recordings through the digital copies, and read the notations and transcripts. The staff of Te Uare Taoka o Hakena - The Hocken Collections maintain this blog to showcase the treasures we find in the collections. We also blog about some of our events and news. 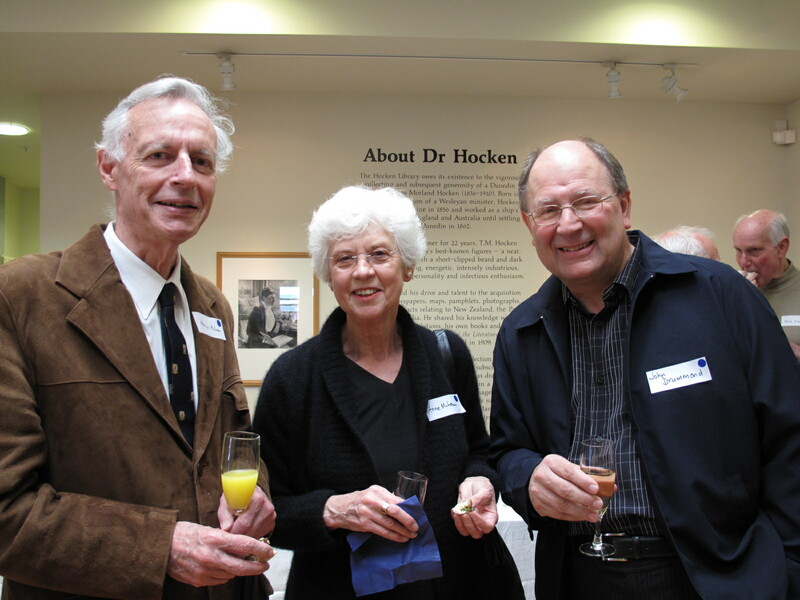 Friends of the Hocken WW1 Transcription Project – Diary of Dr William Aitken 1914-1915, MS-1334/001. Any views or opinion represented in this site belong solely to the authors and do not necessarily represent those of the University of Otago. Any view or opinion represented in the comments are personal and are those of the respective commentator/contributor to this site.